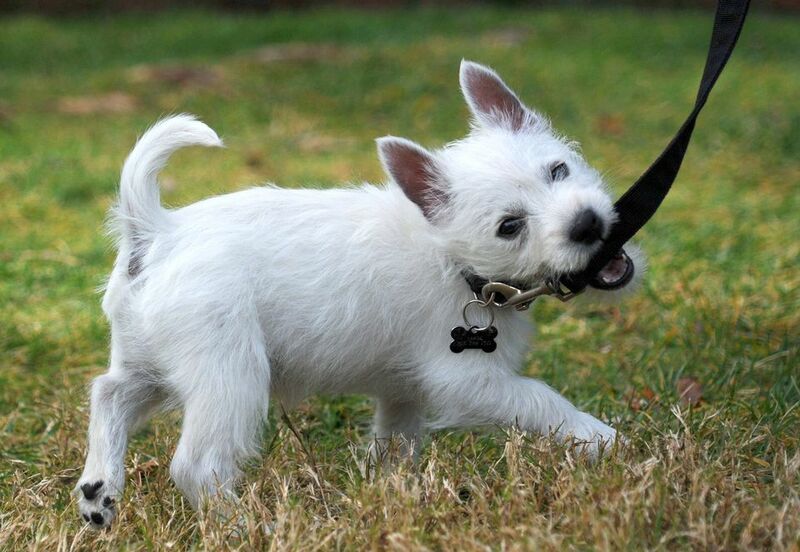 Leash laws may require your puppy to walk nicely on a leash and know how to heel when off your own property. But, even if they don’t, it’s simply polite puppy behavior to know leash etiquette. With proper leash manners, your dog has more freedom to safely explore the world beyond your front or backyard. Large breed puppies can grow into powerful, tugging tanks that are able to pull the leash from your hands or drag you all over. That can be dangerous for you if you're bowled over and dangerous for them if they run into traffic, become tangled far beyond your reach, or get into a fracas with another dog. Even friendly puppies can get scared and a leash provides security and a comfort level when a trusted owner offers guidance through a crowd of strangers or scary situations. Puppies do not instinctively know how to walk on a leash. When you pull, dogs instinctively pull back, and if you allow the pup to win, that can make it even more difficult for them to overcome the urge to do it. It is much easier to teach a small puppy than a powerful adolescent or adult. If you have a puppy, then now is the perfect time to teach it to walk nicely on a leash. Begin immediately when you bring the pup home. Many purebred puppies wear temporary collars (or color-coded ribbons) from birth to help identify them from littermates. But if a collar is new to your puppy, give the dog some time to get used to it. A flat, nylon collar with a metal buckle, that you can fit two fingers beneath, is ideal. You very likely will need to get larger ones as the pup grows, so inexpensive ones at first work fine. For powerful pups that might be tempted to pull you down the street, use a no-pull harness. These training tools work especially well for older, hard-headed pups because it trains them not to pull. The leash hooks to a clip on the front of the dog’s chest so that when the dog pulls, the harness turns the dog back toward the person holding the leash. This effectively trains the dog not to pull. Before attaching a leash or putting on the harness for the first time, encourage your pup to sniff them. Smell is an important way for puppies to communicate; a good sniffing is important. But al leash is not a toy, so don’t allow the dog to chew or play tug with the leash. Choose an appropriate style of leash for the size of your puppy. Lighter weight nylon leashes work well for small pets while heavier leather leashes may be more appropriate for larger pups. It is a good idea to pass on the urge to get a retractable leash. These leashes can teach pups to pull as they reward jumping up, although these may be fine for toy-sized dogs. A six-foot length typically gives puppies sufficient freedom without owners losing control. At this point, just aim for your pup to not surge ahead or drag or pull, but simply to walk nicely on either side on a loose (not tight) leash. If you keep the leash tight, the dog will naturally pull against it so avoid tugging or trying to drag. Hold the leash in your right hand, doubling up the extra slack so it doesn’t drag, and hold that right hand at your belt buckle level. Have treats or favorite toys or other rewards (a sniff of something stinky for nosy pups) and dole it out with your free hand. You may also wish to use clicker training to communicate with your puppy. Show your pup a treat while the dog sits or stands at your side. If you plan to eventually compete in obedience trials or other dog sports, it’s traditional to have the dog walk on your left side. But if you don’t care about competition, it really doesn’t matter which side as long as you’re consistent. Wait until the puppy focuses on the reward. Then say, “Let’s go!” or another verbal cue that you use consistently. It’s important that you how to talk to a puppy in a manner it understands. Hold the treat right in front of its nose as you begin to walk, luring the dog to keep pace. After the puppy understands the concept of loose-leash walking and sitting on command, you might want to change up the speeds. You will want your dog to maintain the pace at your side, whether you walk, trot, or run. Also, practice changing directions. When your pup walks on the left, a turn to your right or an about-face to the right should be pretty easy for the dog to follow. Turning to the left may require luring with the reward at least initially. Turn it into a game so that once the pup understands, you can give praise extravagantly. "Proofing" a behavior means ensuring that your dog will stick with the behavior even in challenging situations. To proof your dog's ability to walk well on a leash, move the practice times to areas that have more distractions. After all, leaving your backyard or living room will be necessary when you go to the park, or take a car ride to visit Grandma, and you want loose leash walking to be a default behavior wherever you go. For instance, you should practice in the front yard during morning rush hour or when your spouse tosses a ball on the other side of the room. As your dog develops more skills, you can start to teach it to "heel." The “heel” position is walking alongside you on your left side at knee-level while stopping and starting when you do, and sitting when you stop. Once your pup pays attention to the "let's go" command and anticipates the “sit" command when you stop, you might want to try getting your dog to heel around the entire perimeter of the yard or do laps outside the house. Jumping up for a reward. The puppy should not be jumping up for the treat or toy, so lower the position if the puppy is trying to jump up. You can also use a long wooden spoon with a sticky treat or a commercial “treat stick” designed for that purpose so you don’t have to bend over. After a few steps, stop and tell your puppy to "sit." Reward the pup with the treat. Rushing ahead or tugging at the leash. Repeat the leash walk exercise with the lure. Stop every few steps, place your pup in a sit or down position, and reward it. The pup quickly should understand that “let’s go” (or other consistent commands) means to walk at your side—and you will pay with a reward when the dog sits as you stop. Behaving properly only when a reward is given. When the pup has performed several exercises, it won’t need to be lured but will want to know you have rewards handy. Increase the pup’s attention span by eventually offering the reward intermittently—rather than every time, pay every second, third, or fourth time. This teaches your dog to always obey since it is unclear when a reward is coming.